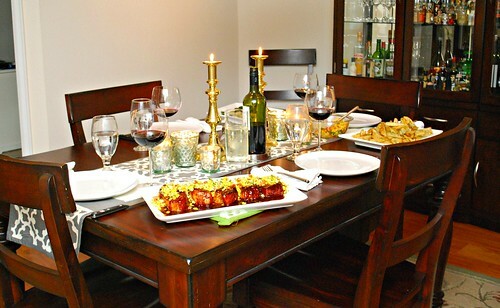 All this week I'll feature some of the dishes I prepared during our stay with G&J. For the dinner I prepared, I used some thick cut pork chops and leftover BBQ sauce from their pantry. I supplemented some of the BBQ sauce with a little homemade version but you could use any BBQ -store bought or homemade - for this recipe. As for the corn relish, I used some leftover sweet corn on the cob they had in the freezer. The corn relish made for a nice pop of color, texture and is great as a garnish or side dish. In a medium saucepan, combine all ingredients and bring to a boil. Reduce the heat to a simmer and continue cooking uncovered until thickened for about 1 hour and 15 minutes. Season pork chops with salt and pepper to your tastes. In a large cast iron skillet oven high heat, add oil. When hot, add pork chops and sear on both sides for 5-7 minutes to form a nice crust. Baste pork chops with some of the bbq sauce on both sides, just enough to cover. Transfer skillet with pork chops into preheated oven. Bake uncovered for 12-15 minutes or until juices run clear. Baste pork chops again with some of the bbq sauce and serve with more sauce on the side. In a medium skillet, melt butter. Once melted, add onions and garlic, cooking until softened. Add corn and bell pepper and season with salt and pepper to taste. Cook until warmed through. Stir in green onion and parsley. 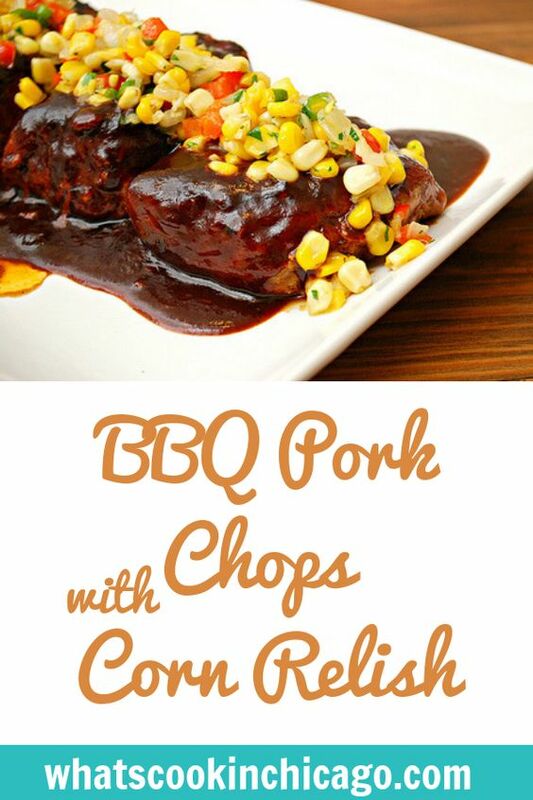 Serve over BBQ Pork Chops or on the side. I must make corn relish to keep on hand. My boys would devour it! I love a good corn relish. 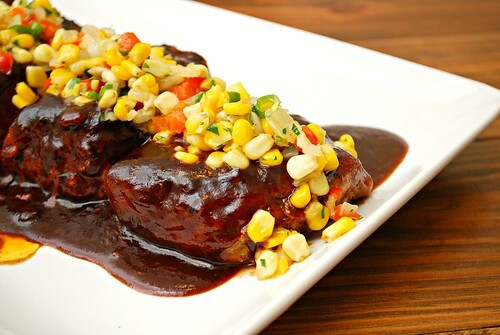 I've eaten bacon and pork ribs for years, I'm not sure what stops me from enjoying a good chop...this bbq sauce looks amazing, that may be the topping I need to enjoy them! Yum! These look absolutely amazing. Can't wait for the truffle oil and salt to come out since I have both in my pantry and don't use either enough! I must say that you’re very talented with clean design and you should get much more attention because you also dig into the business area with your Blog. Oh the corn relish really got my attention. It looks great! 14 cup sugar???!!! I really hope you mean 1/4 cup sugar! !